We are very pleased to be recognized with four Red Dot Awards in Product Design from some of the world’s most prestigious designers. We will continue to strive to design and deliver products that inspire consumers while also adding value to their lives. iLuv Creative Technology, the premier provider of the most comprehensive line of accessories for the mobile lifestyle, announced it has won four Red Dot Awards in Product Design. Dating back to 1955, the Red Dot Design Award is one of the world’s most distinguished and largest design competitions which drew entries from some of the most renowned designers and newest talents. Products are judged by a 30-member expert jury on criteria such as innovation, functionality and quality. iLuv’s award winning products include: MobiAir ™ (iMM377), Vibro ™ II (iMM155), DualJack ™ (iCB17/iCB27) and Mac Cables and Adapters Series which were recognized out of 4,515 entries. 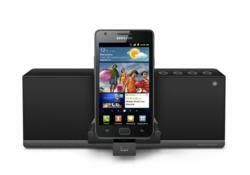 •The MobiAir™ is a universal smartphone audio docking station. The iMM377 uses Bluetooth® technology to bring high-fidelity sound to any Android, Windows or Blackberry smartphone device. MobiAir ™ features iLuv’s patent-pending myBot® OmniFit Technology™, robotic arms that grasp the edges of the device to hold it securely in place, adjusting for various sizes and widths. MobiAir also won a CES Innovations Award this year. •The Vibro ™ II is the latest addition to iLuv’s patent pending Vibro ™ Alarm Clock Dock Series. This sleek alarm clock gently shakes users awake using iLuv’s innovative “Shake and Wake Up” technology. The Vibro ™ II is also a high-fidelity docking station allowing consumers to wake to their favorite music from their iPhone, iPod or FM radio station. The Vibro ™ II also won a CES Innovations Award. •DualJack ™ iCB17 is a combination sync and charge cable for both Apple mobile devices and most smartphones. The hinge design houses both connectors, an Apple connector and a micro-USB, so you don’t have to carry two different cables. In addition, the smart design exposes only one connector at a time, ensuring proper connection and avoiding any syncing errors caused by connecting two devices at once. As it has USB port on the other end, mobile devices can be charged through USB Charger or computers. The iCB27 model syncs and charges GALAXY Tabs, GALAXY S series smartphones, and most other smartphones. •The Mac Adapters and Cables Series is a robust product line up designed to be OS-agnostic, plug-and-play and multi-functional, all with the brushed aluminum look and feel made to compliment the design of the Mac. The cables support a variety of different connections, including USB, Ethernet and SD cards, using only one compact and convenient USB port. The Mac Adapters and cables Series also won the prestigious iF Product Design award. iLuv will be honored at the Red Dot Gala on July 2, 2012 in Essen, Germany and all the winning products will be on display from July 3 – July 29, 2012 in the Red Dot Design Museum. With more than 1,500 products and an area of more than 40,000 square feet, the Red Dot Design Museum houses the world’s largest permanent exhibition of design. The Red Dot Design Award, which was established back in the 1950s, is awarded in three disciplines: Red Dot Award: Product Design, Red Dot Award: Communication Design, and Red Dot Award: Design Concept. In 2011 alone, more than 14,000 entries from over 70 countries were registered. The Red Dot Award has established itself internationally as one of the most distinguished quality seals for outstanding designs. iLuv Creative Technology, the premier provider of the most comprehensive line of accessories for the Apple, Samsung and Smartphone markets, rapidly delivers products for today’s discriminating consumers. Since inception, iLuv has amassed a total of 4 Red Dot Product Design Awards, 2 prestigious iF Design Awards and 21 CES Innovation Awards, recognition for innovative design and engineering in the portable, multimedia accessories, headphones and the in-vehicle accessory categories. Headquartered in New York, iLuv is a division of jWIN Electronics Corp., a leading consumer electronics company since 1997. All iLuv products are conceived, designed and developed in New York and continue to lead in quality, value, design and innovation. Learn more about our distinctive range of products and why iLuv means Innovative Lifestyle Unquestionable Value® at http://www.i-Luv.com. iLuv®and Innovative Lifestyle Unquestionable Value® trademarks are the exclusive properties of jWIN Electronics Corp. and are registered with the U.S. Patent and Trademark Office, and may be registered or pending registration in other countries. All other iLuv® trademarks, service marks, and logos may be registered or pending registration in the U.S. or in other countries. All other trademarks or registered trademarks are the property of their respective owners. © 2012 iLuv Creative Technology.